In its annual report, the Gaza European Hospital has revealed that 20% of Palestinians who were shot by the Israeli army, during the Great Return March processions of the Gaza Strip, in 2018, were children, and more than half of them were shot with live fire. The report stated that 20% of the wounded were shot by Israeli soldiers in the head, neck or chest, leading to the death of 75 children, and added that 92% of the medical procedures on wounded children were bone and vascular surgeries. 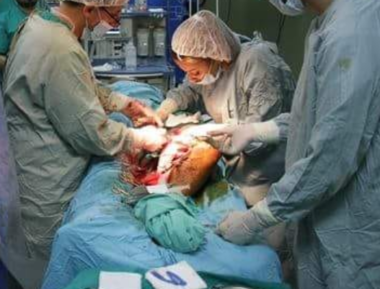 Raed Abdul-Razeq, the head of the Patients’ Services Department at the hospital, stated that surgeons have performed 1,682 surgeries on wounded Palestinians, adding that 58% of the surgeries were orthopedic, 34% were vascular, while the rest were neurological, or in the chest, nose, ears and eyes. According to the report, soldiers shot 1,169 Palestinians, including 43 women, while 59 of the wounded were placed in intensive care units, and 567 others were placed in surgery wards.